*Disclosure: We received free product from the sponsor of the Moms Meet program, May Media Group LLC, who received it directly from the manufacturer. My opinions do not necessarily reflect the opinions of May Media Group LLC or the manufacturer of the product. Sports season is upon us. Kids are back to school and fall sports has begun. Both my kids are very active and stay very busy! My son plays baseball and my daughter plays softball. Both are in a band and active at church as well. With all that said, we also host friends quite often. With all the activity that my kids do, comes lots of thirst! I'm a water drinker, my kids, not so much! They are not allowed to have soda, so when it comes to finding a good, healthy drink for them, I try and search out one that's organic and has very little sugar in it. That can be a challenge! Luckily I am blessed to have a son open to trying new things...and my daughter is getting there. When these arrived, my son wanted to open them right up. I prefer to chill them in the fridge for a bit first. I like my drinks cold. They just taste better, fresher. So we waited until the next day to open them up, served them with some ice and sat on the porch evaluating the Santa Cruz Organic Pomegranate we just poured. Refreshing! It was so crystal clear and had the "just squeezed" taste. What I loved about this product was that it's gluten-free and Non-GMO certified made with USDA Organic certified ingredients, with organic juice/fruit puree as the first ingredient after water. The entire Santa Cruz Organic line of Agua Fresca is made with the same core ingredients, such as organic fruit juice, sugar and a hint of lemon juice. 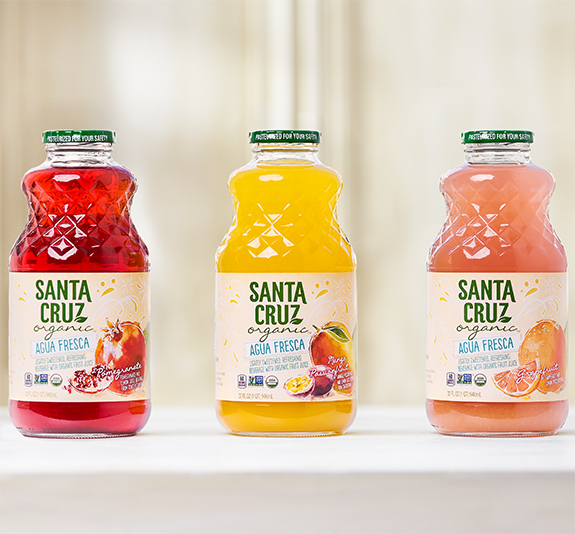 Available in three amazing flavors - Pomegranate, Mango Passionfruit and Grapefruit. Retails for around $3.50 depending on your location.